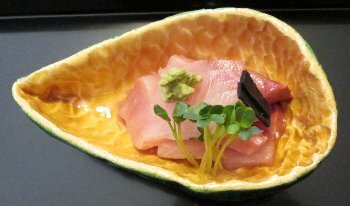 This Winter - New Years kaiseki workshop will include: hamachi (yellowtail) sashimi, ozoni (New Years soup with ground turkey dumpling, fish cake and mochi rice cake), furofuki daikon (simmered daikon radish with miso topping), kohakunamasu (vinegared dressed carrots, daikon & dried persimmon), sekihan (red beans and sweet rice [aka - happy rice]). 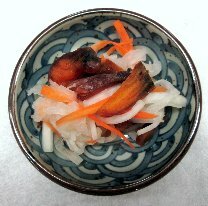 Ichiban dashi soup stock will also be made using konbu (kelp) and katsuobushi (shaved dried bonito). The class will be mostly demonstration. 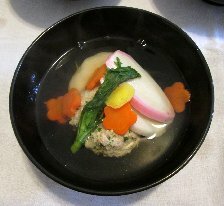 Participants will sample the dishes prepared and easy to follow recipes will be provided. * Please Email teatimes@chanoyu.com with any questions. For Reservations click here. JCCCNC 415-567-5505. Thank you.